With the 8-bit system fonts post being so popular I just had to jump right in and look at the system fonts available on the 16-bit machines! The IBM PC’s first color graphics card was known as the Color Graphics Adapter. The large bold letters work well on the low-resolution displays at the time and many of the quirky were unlikely particularly noticeable there. Apple’s second attempt at a GUI (after the Lisa) was the Macintosh. The system font was called Chicago initially as a bitmap font which was replaced with a scalable TrueType version. With Mac OS 8 it was replaced with the similar Charcoal typeface and then dropped entirely in Mac OS X which uses Lucida Grande for the UI. This font was dusted off again in 2001 and with a few minor tweaks became the system font of the iPod (classic & mini) until the higher resolution color display model. The high-resolution display let the designers really pay attention to detail and even though it was a 1-bit monochrome display it really looks beautiful for the time. It was little wonder that when Jobs went to NeXT they went with incredibly high-resolution monochrome displays again (at least initially and with 2-bit gray-scale). It’s unlikely they were digital. The Amiga started with ex-Atari engineers desperate to design a 16-bit machine. It would eventually be purchased by Commodore and offer incredible graphics and sound that put Macs and PCs of the time to shame. Despite shipping with many fonts and supporting proportional text the default system font was a traditional fixed-width font called Topaz/8. The Workbench booted in white-on-blue (shown) and was intended for use either with their own Commodore monitors or home TVs. Despite the choice of a serif font it worked quite well on these displays although interlace was quite unusable without specialized displays. Very similar to the IBM CGA system font, very likely to be derived from there. The Amiga shipped with it’s own font editor called ‘Fed’ found on the Workbench Extras disk in the Tools folder. Commodore’s update to the Amiga saw all sorts of changes in the ROM and Workbench for the GUI including some revisions to the font and the ability to change what font the workbench used. The Workbench booted in black-on-grey (shown) and the new font looked a lot more friendly as well as being a more legible choice for home TVs. Obvious modification of the prior 1.x font to remove serifs and improve legibility. WBScreen allowed you to choose which font to display in Workbench including some of the proportional fonts included. The Atari ST was Atari’s answer to the Commodore Amiga after they failed to purchase back the talent and technology. The machine’s GUI was based on GEM from Digital Research. The font was very clear and worked well in both square pixel (low resolution) and rectangular pixel (medium resolution) modes. Almost identical to the Atari 8-bit font but with the capital letters, symbols and numbers extended a pixel higher (inverse symmetry was no longer a concern) and more consistent/cleaner lowercase letters ‘sj’. It is possible to change the system fonts used by the GEM desktop using the ST Font Loader. Given that this screen mode was only available on high-resolution monitors it is very rectangular and failed to really take advantage of the unique situation in which it would be used. Very likely based on the medium resolution font with some redrawing. A reasonably nice serif font that gave a serious look if somewhat inconsistent in places. Almost certainly based on the original CGA font. Can be overridden by tools like fontedit.com. My love of typography originated in the 80’s with the golden years of 8-bit home computing and their 8×8 pixel monospaced fonts on low-resolution displays. It’s quite easy to find bitmap copies of these fonts and also scalable traced TTF versions but there’s very little discussion about the fonts themselves. Let’s remedy that by firing up some emulators and investigating the glyphs. Commodore’s first business machine was the PET which came with a built-in monitor and a full character set unlike other machines at the time. The font is good choice for the original PET and its original monitor. It was unfortunately also used on the Vic-20 despite having half the screen resolution where it made a poor choice. While not visibly influenced from anything else an almost direct rip of this font appears to have been used in the Apple Lisa debugger. Apple’s first professionally built computer was the Apple ][ which from rev 7 onwards added lower-case letters. The font is well suited to the default high-contrast white-on-black (often green-on-black) given the machine was intended for use on their own monitors. The upper-case, numbers and symbols were copied from the Signetics 64 × 8 × 5 character generator 2513 chip used in the Apple I and II in revision 0 to 6. The later Texas Instruments TMS9918 Video Controller Chip used on Sega, Nintendo, Colecovision and TI/99 machines re-used this font with only a couple of pixels changed. Changing the font requires replacing the 2 KB 2716 pin-out ROM with your own EPROM or alternate ROM. Atari’s entry into the home computing market put out some very capable machines with all sorts of hardware tricks (the creative geniuses behind it would go on to form Amiga). The same font was used on all Atari 8-bit models from the original 400/800 to the XL and XE models in the late 80’s. Braces are overly bold being 3 pixels wide. Less than and greater than symbols are too tall. The machine boots in a low-contrast blue-on-blue and is designed for use with TV’s which explains some of the odd characteristics above like the square U to distinguish it from the V. It is likely the 6-pixel choice is to allow the letters to be centered when using inverse letter mode. One byte per row, 8 sequential bytes making one glyph. You can reprogram this by poking address 756 with the page number of the new font (default of 226 for ROM location 0xE000). The Beeb, as it was affectionately known, has its own font which could display in three different modes – one wider and one narrower but many users might not recognize it all as it booted into ‘Mode 7’ utilizing a Videotex chip (used in the UK for text-on-TV and travel agents as well as in France for Minitel) that had a different font of its own. The machine generally shipped with good quality monitors and the combination of high-contrast colors and this bold font made it very readable indeed. It’s quite likely it was influenced by the Atari 8-bit font but with larger capitals and ascenders and a much more consistent look. 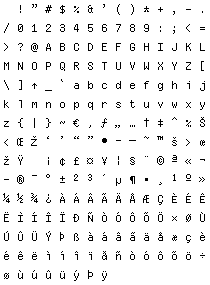 The system font is stored at 0xC00-0xC2FF with each character being represented by 8 sequential bytes (left pixel is high bit). You can replace the font used by system text routine OSWRCH (0xFFEE) using the VDU command 23 followed by the ASCII code and then 8 rows of data, e.g. Sinclair’s successor to the ZX81 added color and lower-case letters – again preserving the uppercase and numbers from its predecessor but finally mapping them to ASCII. This font was re-used on Jupiter Ace and Timex machines but the ZX Spectrum was the most popular. While the machine has a default high-contrast scheme the video output was poor because of the quality of the RF modulator and home TVs it was connected to. It looks like the designer decided to increase spacing between letters after the ZX80 from one to two pixels which greatly limited what could be done with the letters themselves. This was likely done for the same reasons it was done on the Atari 8-bit – namely to allow the letters to be centered when using inverse text modes. The font was mostly inherited from the ZX80. I was not involved with that, so I don’t know who did it. Probably it was a combination of John Grant, Jim Westwood and Rick Dickinson. It’s possible we added lower case for the ZX81 or Spectrum (I can’t remember without checking), and I do remember discussions about how “mostly moistly” would appear. Commodore took to take their success with the PET and applied it to the home first with the VIC 20 and then later with the wildly successful Commodore 64. The bold font was essential for the low-quality TV’s Commodore were aiming at. The inconsistencies across the font may have been intentional to help make the letters look different (A vs 4, 1 vs I, 7 vs T) given the limitations of the displays or just poorly implemented (see below). Lower-case is identical to the Atari 8-bit font and likely copied wholesale as they do not match the upper-case well. Symbols, numbers and upper-case are a bolded version of the PET font that looses the serifs and also could explain the odd reproductions of 1, 2, 7 & 4. See comment from Paolo below for details! Alan Sugar’s foray into the UK market came a little later than the other 8-bits in 1984 with the Amstrad CPC series. Sugar wanted the machine to look more professional than other home computers at the time. The choice of a serif based font to look like PCs which also featured serifs (at a higher resolution) reflects that desire. Very similar to the IBM CGA font with some adjustments (fixes) to the horizontal positioning of some symbols. Many characters completely identical and some bearing style similarities too (wider 0, X choosing one side to be longer than the other). 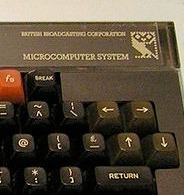 Some other characters bear similarity to the BBC Micro (Q uses the same trick to keep it distinguished) and a number of symbols and lower-case letters being the same where serifs would not fit. The Amstrad CPC manual shows the system font but is different in some areas. It is possible it is a transcription problem (z is shifted up one pixel, missing pixels on ’37PRz~’ and extra pixels on ‘#b’ ) although it could have been an earlier version from the designer as ‘rG?’ are subtly different. Redefine using the Amstrad BASIC command SYMBOL that takes an ASCII code and then 8 comma-separated values one-per-row in much the same way as the BBC with the VDU 23 command. SYMBOL AFTER must be set first e.g. The MSX differs from the other machines here in that it was a standard rather than a specific machine. It was very popular in Japan and did hit UK shores although I only knew a single person that had one apart from our school which had acquired several Yamaha models to control MIDI keyboards. Given the multiple manufacturers, it’s not surprising that some models had slightly tweaked fonts but the one shown here seems to be the most popular. An unusual choice that feels very quirky. Most likely influenced by the Apple ][e.